The KSC Door Handle Protector is available in 2 different tapered designs, Diamond and Bar. Both help deflect collisions that can destroy a doorknob or cause serious injury. Diamond Design - 11 1/4" x 6 3/8" x 2 7/8"
Bar Design 12" x 3 3/16"
Are the door protectors UL or WHI listed and approved for use on Fire rated doors? If so were can I get a copy or view the listing certification? 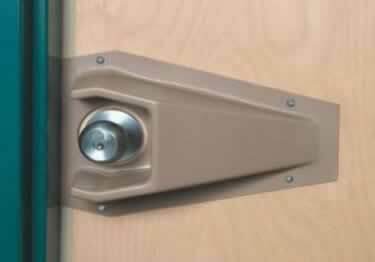 Available in 2 designs and 4 colors, find a door handle protector that will offer the protection your door needs and one that is perfect for you. THIS IS BEING USED IN A POST OFFICE. THIS IS BEING US TO PROTECT A THUMBTURN FOR MORTISE LOCK. THIS IS WOKING WELL FOR THE POST OFFICE.